Just a pencil attached with a rubber band has served as a capo for many poor musicians. This was the first thing I tried when I heard about capos, and I know many others have done the same. It works. Not good, but better than nothing. 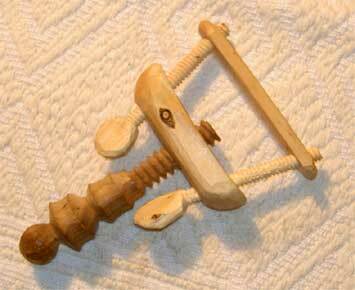 Here's a more sophisticated model. 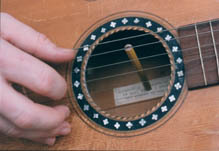 I had my grandmother's old guitar and I stuck a pencil (with a groove in one end) into the soundhole. The pencil supported the A-string and I got the high note I wanted on the fifth string. With that, and Pete Seeger's banjo book, I made my first attempts to play the 5-string banjo. 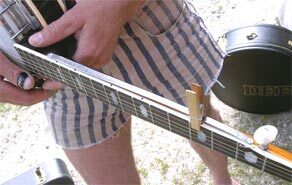 Attending a banjo workshop at a bluegrass festival in Norway 2004, I first didn't beleave my eyes when I saw this 5th-string capo. I guess things like this might contribute to making banjo players an everlasting source of jokes. 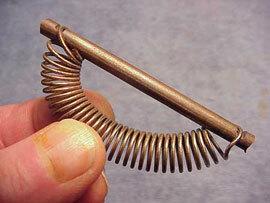 A slightly modified clothes-pin attached to a metal rail along the banjo neck. When I told the guy that I collect capos and have a capo museum on the web, he opened his banjo case and presented me with this wonderful piece of folkloristic artwork! Being a banjo player myself I'd like to think of these rare items as creative expressions of his artistic and inventive mind - rather than just being a banjo player. The rather awkward openening and closing of the capo, by manipulating the two smaller screws, eventually made the inventor invest in a commercially manufactured capo. Made by Roman Christoph Kohler.